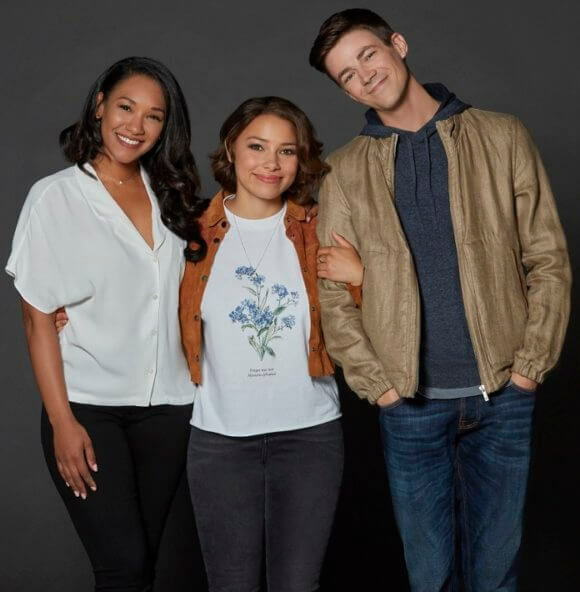 During the season four finale of The CW’s The Flash, Nora (Jessica Parker Kennedy) arrived at the West house and Team Flash was taken by surprise by the time-traveling speedster. Barry (Grant Gustin) and Iris (Candice Patton) were shocked to discover the daughter they haven’t yet had time-traveled from the future seeking Barry’s help. Nora’s brief interaction with her mom and dad revealed she has a close relationship with Barry but not with Iris. In our interview at the San Diego Comic Con, Patton discussed the addition of Nora into the series and what fans of the superhero show can look forward to in season five. The CW’s The Flash premieres on October 9, 2018 at 8pm ET/PT. What can you say about season five? And why she’s mad at you. Since Nora’s appeared, will there be a strain on Barry and Iris’ relationship? Is she going to be seeking advice from her dad to help understand the situation? And what about Grandpa Joe? So now you have a grown child and an infant sister? Do you ever find yourself needing somebody to clarify something? Do you think the team dynamic is going to change? How do you think Nora will impact the series moving forward? As you continue to peel back layers of your character, is there anything you’re surprised to learn about yourself as an actor? Candice Patton: “Yeah. Every year it’s something different. I was dealing with her life possibly being taken away in season three. I think this season’s going to be a big one for Iris dealing with the idea of motherhood and the fact that she didn’t have a mother in her life. That fear of feeling like is she a good mother to Nora in the future. I think she has a fear there since Nora and her are not connecting. Maybe her future as a mother is not a good one and she’s just like her mother. So, that’s something she’s going to have to contend with this season. It opens up new things for me as an actress, which is interesting and exciting.